There are currently 29 stations available nationally on Freeview, these include both BBC and commercial radio stations. Channel numbers are liable to change without notice and bitrates can also change from time to time. 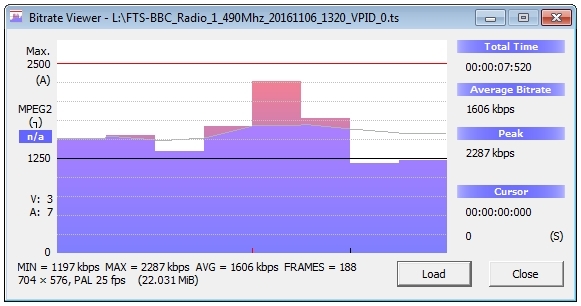 Freeview radio quality on most BBC national radio stations is 192 kbps, though this is acceptable quality, though it is still not as good as FM. Voice quality is almost identical between Freeview and FM, speech does not make great demands on bandwidth. However, when music becomes more demanding, with more background instruments playing at the same time, FM still provides a much more enjoyable listening experience. It is not that FM is better than Freeview, it is more to do with bandwidth limitations and the bitrates broadcasters use on the platform. Currently, all radio stations are on DVB-T multiplexes using older less efficient MPEG 2 encoding. As is the case with DAB, Freeview is a space constricted platform with a limited number of multiplexes. Freeview will never be able to offer the same range of stations available on other UK platforms. When the UK switches DVB-T multiplexes to DVB-T2 in the future, this could allow more stations to join the platform, or allow those already on Freeview to raise quality by utilising newer more efficient technology. If you have any corrections, please email this site to have them included. BBC Radio 1 PSB1 700 192 kbps Joint Stereo Current hit music, dance and rock. BBC 1 Xtra PSB1 701 160 kbps Joint Stereo Urban music, hip-hop, grime and dancehall. BBC Radio 2 PSB1 702 192 kbps Joint Stereo Adult contemporary, oldies, country, jazz, soul and funk. BBC Radio 3 PSB1 703 192 kbps Joint Stereo Classical, jazz, world music, arts, culture and drama. BBC Radio 4 PSB1 704 192 kbps Joint Stereo Spoken-word programming, drama and philosophy. BBC Radio 5 Live PSB1 705 96 kbp/s Mono News, current affairs, discussion and sport. BBC Radio 5 SX PSB1 706 96 kbps Mono Additional sports coverage. BBC 6 Music PSB1 707 160 kbps Joint Stereo Alternative music, rock, reggae and other minor genres. BBC Radio 4 Extra PSB1 708 160 kbps Joint Stereo Archive programming, including drama, plays and comedy. BBC Asian Network PSB1 709 128 kbps Joint Stereo Station for the British-Asian community. BBC World Service PSB1 710 96 kbps Mono International radio station for current affairs. BBC Local Radio PSB1 719 96 kbps Mono Local radio in England. BBC Radio Scotland (Scotland only) PSB1 719 128 kbps Joint Stereo BBC Radio Scotland is Scotland’s national radio station. BBC Radio Nan Gàidheal (Scotland only) PSB1 720 128 kbps Joint Stereo BBC radio station, broadcasting in Scottish Gaelic. BBC Radio Wales (Wales only) PSB1 719 128 kbps Joint Stereo BBC Radio Wales is Wales’s national English language radio station. BBC Radio Cymru (Wales only) PSB1 720 128 kbps Joint Stereo BBC Radio Cymru is Wales’s national Welsh-language radio station. BBC Radio Ulster (NI only) PSB1 719 128 kbps Joint Stereo BBC Radio Ulster is one of two national stations in NI. BBC Radio Foyle (NI only) PSB1 720 128 kbps Joint Stereo BBC Radio Foyle is one of two national stations in NI. BBC Radio London (London) PSB1 721 96 kbps Mono Local BBC radio for London. The Hits Radio Com6 711 64 kbps Mono Contemporary pop music. KISS FRESH Com5 712 64 kbps Mono Hip-hop, R&B, EDM, House and Garage. Kiss Com5 713 64 kbps Mono Dance, hip-hop, R&B. KISSTORY Com5 714 64 kbps Mono Electronica, dance, R&B, trip hop, acid house, alternative dance. 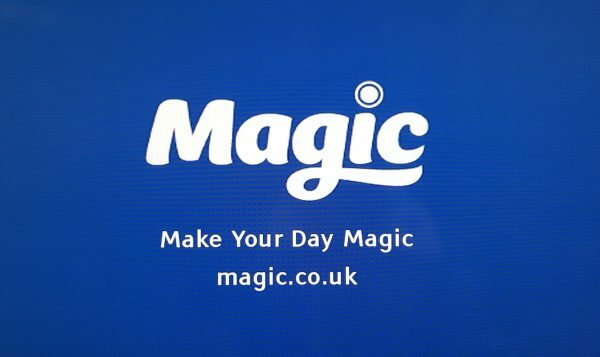 Magic Com5 715 64 kbps Mono Hot Adult Contemporary. heat Com6 716 64 kbps Mono Contemporary music. Smooth Radio Com6 718 64 kbps Mono Adult contemporary. Kerrang! Com5 722 64 kbps Mono Rock music. Talksport Com5 723 64 kbps Mono Sports commentary, discussion and news. Capital FM Com4 724 128 kbps Joint Stereo Contemporary hit radio, news, entertainment, speech, showbiz. Premier Radio Com6 725 64 kbps Mono Christian programming. U105 (NI only) PSB2 726 160 kbps Joint Stereo Soft AC/Oldies/Easy listening. Absolute Radio Com4 727 128 kbps Joint Stereo Modern adult contemporary. Heart Com4 728 128 kbps Joint Stereo Rhythmic AC & Hot AC. RTÉ Raidió na Gaeltachta (NI only) NIMUX 729 128 kbps Stereo Irish-language radio service from RTÉ. RNIB Connect Com5 730 64 kbps Mono Radio for the Blind and partially sighted (RNIB). Classic FM Com5 731 128 kbps Stereo Classical music. LBC Com5 732 64 kbps Mono Rolling news and discussions. Trans World Radio (TWR) Com7 733 64 kbps Mono Christian programming. BBC Local Radio is available in most areas of England on Freeview on channel 719, 720, 721, 722, 734 and 735, depending on where you live. Some areas have more than one local BBC station available. BBC local stations in England are broadcast on the PBS1 multiplex operated by the BBC, unfortunately only in mono at present at the low bitrate of 96 kbps. The BBC broadcasts two local or national radio stations in Scotland, BBC Radio Scotland in English and BBC Radio Nan Gàidheal in Scottish Gaelic. BBC Radio in Scotland is broadcast on the PBS1 multiplex operated by the BBC. The BBC broadcasts two local or national radio stations in Wales on Freeview, BBC Radio Wales in English and BBC Radio Cymru in the Welsh langauge. BBC Radio in Wales is broadcast on the PBS1 multiplex operated by the BBC. The BBC broadcasts two local or national radio stations in Northern Ireland, BBC Radio Ulster and BBC Radio Foyle. BBC Radio in Northern Ireland is broadcast on the PBS1 multiplex operated by the BBC.